ROZ!!!!!! This has got to be the most amazing shoot you've done, i adore it. Especially the equestrian theme, it reminds me of my younger days riding my ponies. Good memories! Your legs look soooo long. Super model in the making? Another great post, tell your dad his photos are excellent. I like the hat !! I love this shoot and the composition of the photos! You look great, I especially like how you made a more classic outfit look modern and exciting! I always enjoy reading your blog! You have such good photos and make a great model! I hope to visit England one day! Please come visit and follow! Your father is definitely one of the best photographers who "know" give my congratulations, I insist that you make an explosive pair! 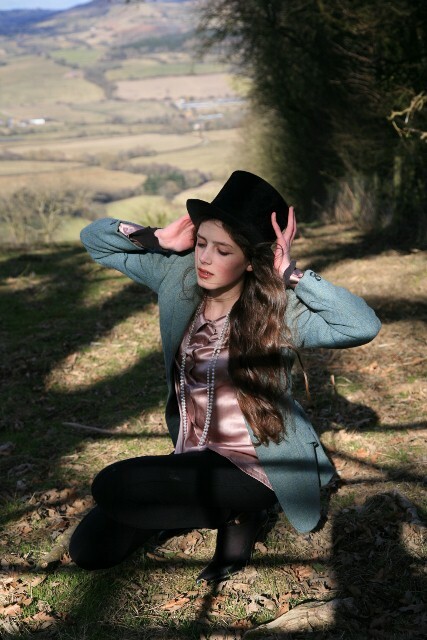 I would like you to do a session based on Alice In Wonderland, or rather in The Mad Hat, would be very good. Well, pretty girl, I gotta go. A big kiss to you and your Dad. Gorgeous photos and great great outfit! My lord you have LONG legs girl!! :) I love the combo of textures you have going on and what a great jacket! I seriously want to move to wherever you are, the scenery is so fantastic. You capture your looks so well and your father is an excellent photographer. Anyway, again thanks for sharing! What gorgeous photos, love the shot of you standing in the lane, it's just so lovely. You and your dad make an amazing team! I love the moody feeling that comes through in many of these pictures because of the sky and the lighting. There is a sense that a storm is brewing and there is an inherent sense of danger perhaps. Oh I've missed some great posts! I love this & will return soon to look more carefully. I thought that title was clever & I do remember it now.. I'll send you an email about this later, I got all involved in trying to help her company financially. Small world. All your pictures are so beautiful! Your blog is lovely...I will link you in my blog! You are true model potential! I love how you find so many thrifted gems! Amazing blog. The black and white photo is breathtaking! It looks like it came straight off the pages of Vogue or Harper's. 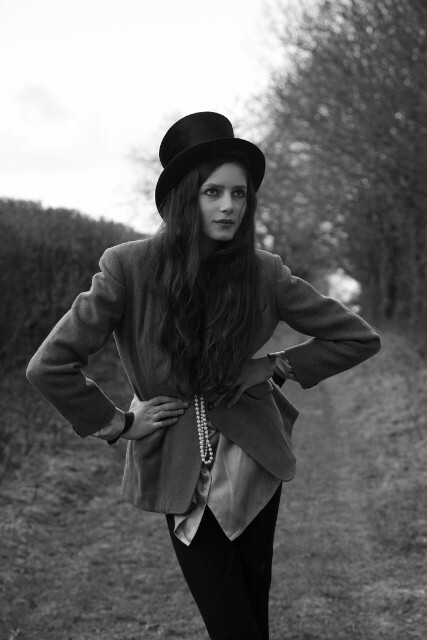 I've just come across you blog and really love your style, the pictures in this post are just divine and I love that jacket!! I'll go ahead and join the ranks of those who compliment you as a fantastic model. You have a great sense of posing (not to mention showing off your assets. You really know how to show off those long legs to the camera). Speaking of legs, kudos on the jodphurs! I've been trying to find a decent pair, but alas living in Middle America doesn't seem to lend much to finding a pair. Fantastic lighting! I remember last time I asked you said the lighting was natural. Is it natural again here or was there a fill light involved? If not wow....you must have just hit a perfect time of evening to shoot. The contrast in the sky vs. ground in the first and third is exquisite! the jacket is incredible! i've never entered a charity shop, but now I think I must do it. By the way, amazing shoot, your dad is a great photographer! beautifull pictures you have ! i can't believe you thrifted those pieces. jealousy. the pink shirt just makes this perfection. i die. This post is beautiful!!! Your outfit is amazing!!! this is beautiful in the most beautifulest of ways!!! u r quite stunning. Love your outfit!! it's amazing, it reminds me of the Dior Haute Couture 10 collection! You look fantastic! Your legs go on forever, and this outfit is gorgeous. You are amazing! I love everything about these pictures. Your scenery and outfits are always so wonderful. Your poise and elegance always amazes me! I found a pair of horse riding pants in my local Salvos last winter and I wore them no-stop they are mos def the new leggings!!!! Ultra comfy and warm. I have to ask...are you a dancer at all...or have you modeled before?? The last photo is straight out of Vogue...for real!!!!! Ok your fashion is AMAZING!! WOW love the photos !!! !